Lace up your shoes and run for those who can’t. Team TRF is a program designed with our busy and active supporters in mind. 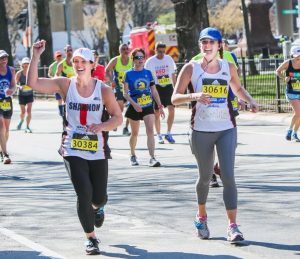 Shannon and Caroline run the 2016 Boston Marathon. Our Team TRF program works in two ways. First, we are proud to participate in both the Boston Marathon and the New Balance Falmouth Road Race. 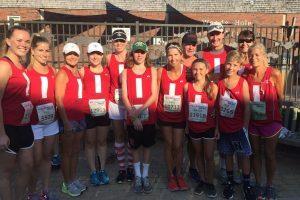 We review applications to select the most enthusiastic, passionate, and dedicated runners for these teams in order to raise money and spread the Foundation’s mission. To learn more about these races, visit the links on the right. In addition to these two races, the Team TRF program gives athletes the flexibility to register for any race, anywhere – whether it’s a 5k, a triathlon, or a marathon, locally or across the world – and set up their own fundraising page for the event. Runners can fundraise however they like, whether it’s an online campaign, a local hockey tournament, or a bake sale. Both options provide athletes with training and fundraising support from our experienced staff to assist you along the way. Need to find a race to run? That’s the easy part! Check out the links below or reach out to our running coordinator at running@travisroyfoundation.org. 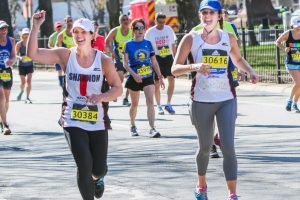 The Travis Roy Foundation has been selected by the John Hancock® Non Profit Marathon Program to receive a limited number of charity bibs for the 123rd Boston Marathon on April 15, 2019. Team TRF has been selected for the 2019 race. 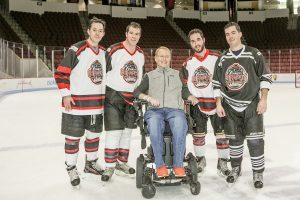 Consider joining TeamTRF to fundraise for the Travis Roy Foundation while training for the big race!